Mad Men is back, which means you can finally start playing your Sunday night "Peggy Leans In" drinking game again! And thanks to our guide, it also means you can play it at literally every NYC bar and restaurant they drink or eat (or drink!) at in the show, that's still open today. Also, if you're not caught up, this is filled with spoilers. The Scene: The Ad bros take Pete out for his bachelor party. As irony would have it, Alison Brie was not yet cast as Trudy Campbell, so Pete was celebrating his freedom from a picture frame stand-in. Today: The LES’s Slipper Room, a bar and experimental performance space, opened in 1999, closed in 2010, and then reopened in 2012. There's no mention of the current incarnation existing in Mad Men days, BUT, that doesn’t mean you can’t see what’s on stage seven days a week. Keep in mind these shows are more performance art than, well, whatever it is you do at a bachelor party. The Scene: The infamous Roger Sterling diet! Don and Roger have oysters and martinis for lunch. For dessert, cheesecake and martinis. Later, Roger publicly revisits his meal. Today: We are testing the limits of the Mad Men/NYC parallel universe, because there is no explicit mention of the commuter standby. 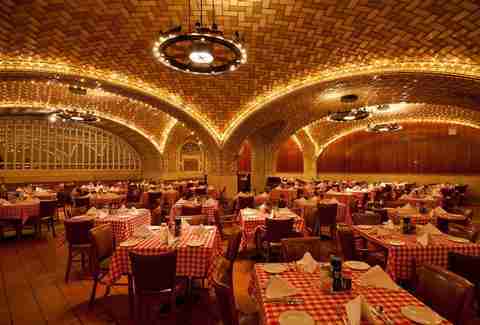 However, we do see the picnic table cloths, a signature of the Oyster Bar, and Google Maps tells us that it's only an 8min hobble from the original Sterling Cooper 405 Madison Ave address to the Grand Central Oyster bar. That’s like half a pack of Dunhill's. The Scene: Sal orders a Campari with a twist when he meets Elliot from Belle Jolie Lipstick. This leads to dinner, which then leads to an offer to see Elliot’s view. 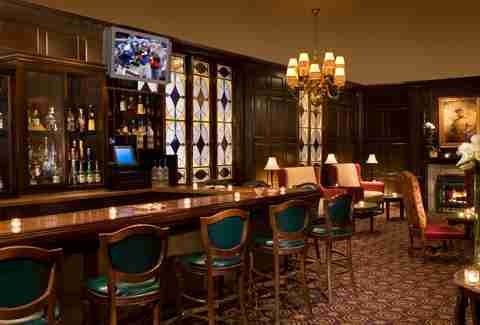 Today: You can find the Madison Club Lounge a short staircase away from the 45th St entrance of the Roosevelt Hotel. While the lounge opened less than 20 years ago, it has the look of the meeting spot of Sal and Elliot. 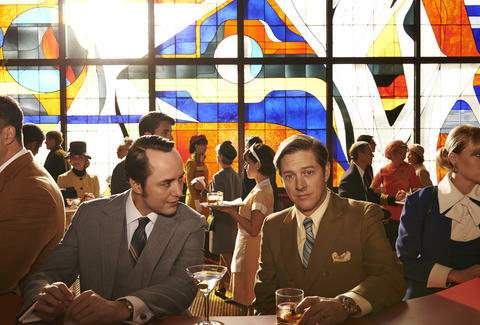 The hotel honors its Mad Men roots with premiere parties, which feature several types of bourbon Old Fashioneds. Anthony, who has bartended 17 years at the lounge, calls Old Fashioneds, “The Grandma and Grandpa drink that young people like.” Their standard is served with Buffalo Trace. The Scene: Pete doesn’t like the successful, self-assured Peggy. And he will not dance the twist with you, or anyone. Today: "No Internet jukebox on our watch!" says P.J. Clarke's. Sure, it has “compact discs”, but who even knows what those are! The Sidecar is first on the cocktail list, so if you're feeling nostalgic for a time when you weren’t alive, go for it. It isn’t 1885 in all respects, though: they take credit, and an Old Fashioned will set you back $15. The Scene: Don is in extra-marital lady overload. He is propositioned by a married lady while having the chance to meet with a lady he once propositioned, who is now married. Don has some luck running into his exes while out with new ladies. It's almost like it was scripted! 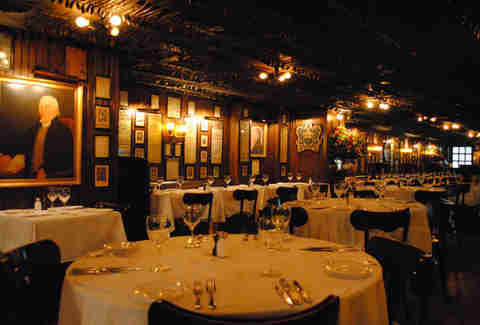 Today: Sardi’s pre- and post-theater menus both include the steak tartare, which is prepared at your table. Nothing says baller like rolling the dice on a tapeworm. The Scene: Don doesn’t want to take the money from Pete’s buddy “HoHo”, who thinks jai alai will be the "new national pastime". Today: Keens wants the experience to be classic. They even have a classic moose head on the wall. Once you're finished staring at the taxidermy, order the mutton chops, which are made with a recipe that's virtually been unchanged since 1885. The Scene: Greg, AKA Joan’s future ex-husband (SPOILER!) doesn’t land the Chief Resident of Surgery. He spends the afternoon sulking in a place where many have sulked before. 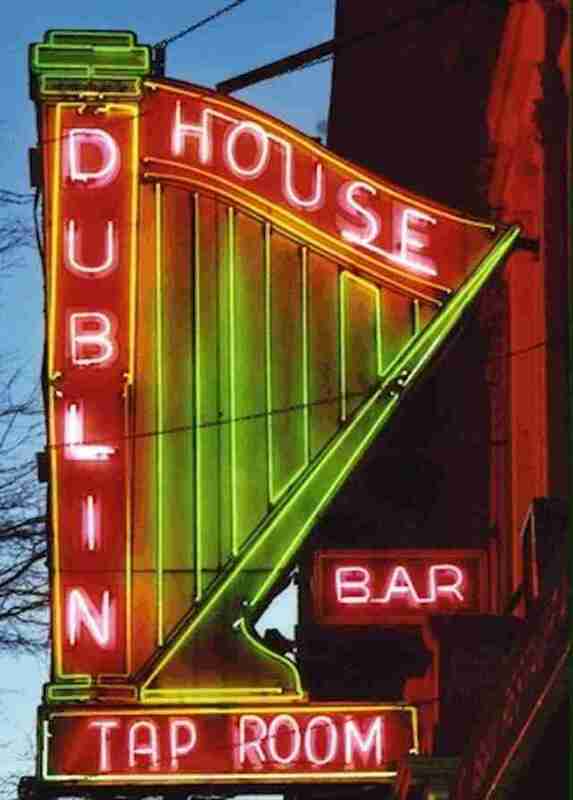 Today: Dublin House is the sort of place where the bartender starts pouring your drink before you find your seat. If you're looking for a Mad Men experience, when Tony is slinging drinks, he'll suggest a shot and a beer (he has only seen a few episodes). Don’t forget to bring cash. They aren’t installing a credit machine for you. 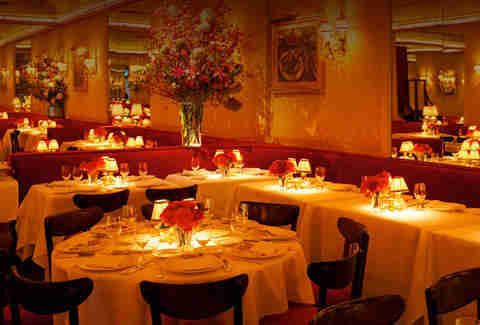 The Scene: Joan made the gents from Puttnam, Powell, and Lowe reservations at La Grenouille, followed by tickets to Oliver. This episode is really known for a lawnmower and a foot. Poor guy. Today: Flowers are as much of a draw as the French food. If you wish to dine like the men of SCDP, you best dress like one. Jackets are required. 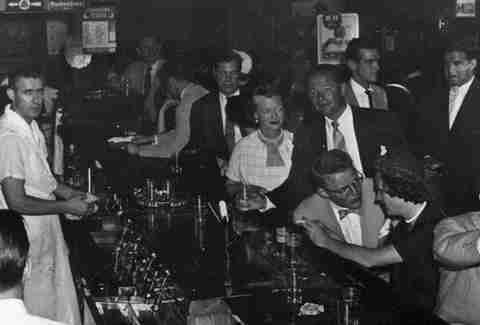 The Scene: A friendly neighbor at Don’s bachelor pad jokingly wondered if he worked at Dylan Thomas’s ole watering hole. 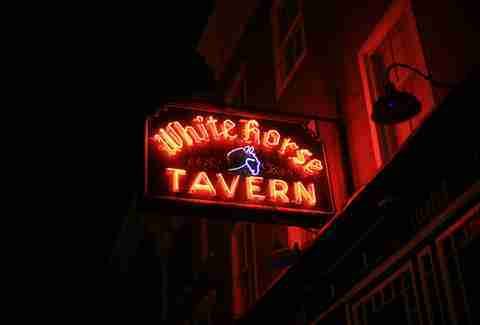 Today: White Horse is so old-world, they don’t accept credit nor do they have a website. That Internet stuff is left for the fans. Plenty of space if you want to sit outside or in, just don’t ask to use their Wi-Fi. 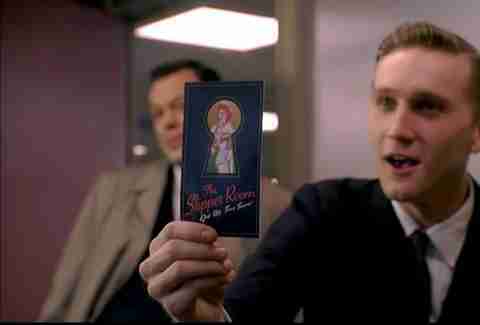 The Scene: Don turned his research on Honda into a date with that blonde, vampire racist from True Blood. 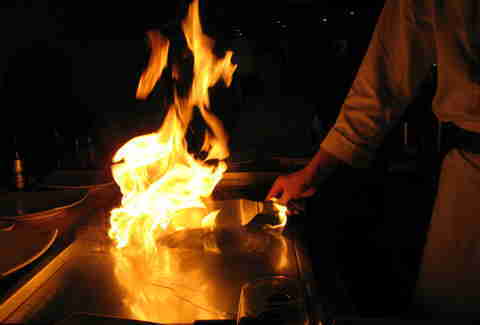 Today: In 2014, you can partake in a Benihana evening in cities like Coral Gables, Florida, but if you want to rock it at the original, it’s on the West side of Manhattan. Just be sure to keep your cool during the lemon juggling. These are trained professionals. The Scene: Bethany, Don, Betty, and Henry all dine together like one giant, happy, blended family! So modern! If only. Betty needs some time alone to process Don with a younger version of her. 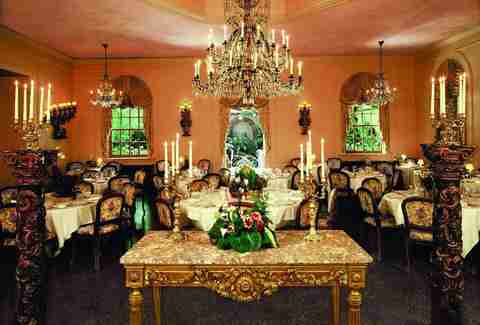 Today: The décor at Barbetta is landmarked so it looks as it did in 1964-65. It remains a date destination, and for some, THE datestination. Owner Laura Maioglio, who took over in the 1960s from her father who founded the restaurant, said that they see many proposals a year. “We once had someone ask if the ring could be baked into a cake,” Maioglio said. “We had to decline.” The agnolotti and minestrone giardiniera have been on the menu since 1906, if you want to taste the history. Also, The Departed was filmed here. The Scene: Abe, Peggy’s then boyfriend, proposes... that they move in together. He hints at ordering the steak. Does Abe have an income? 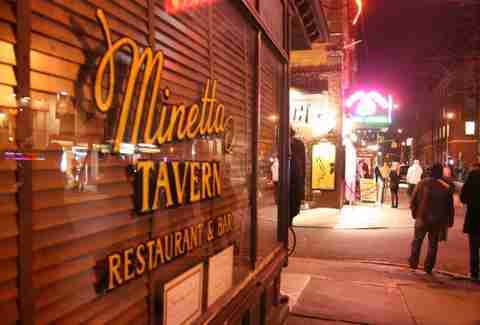 Today: Minetta has evolved from a local hangout to a “better call three weeks in advance” type of joint. 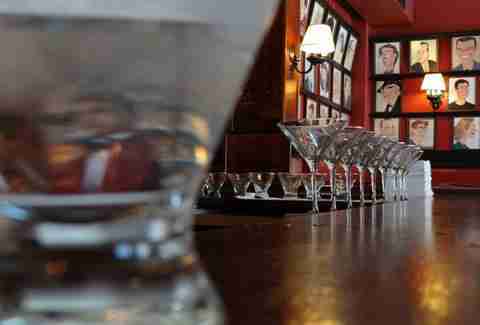 Expect a seven-deep wait to eat at the bar, even on a Sunday. Also, they have an amazing burger. The Scene: Joan made reservations six years before Le Cirque opened! 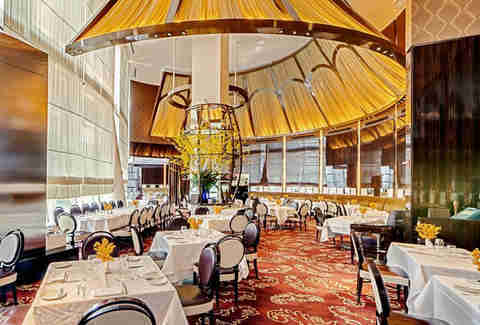 Today: Other than being one of the fun, historical inaccuracies of the show, Le Cirque is also a New York City landmark that opened in 1974. Reservations can be made through the end of the year. The Scene: Most of the office met Cutler’s “doctor” by the time Don asked Peggy about soup. John Mathis (don’t pretend you know who that is) unwittingly referred to the soup at Carnegie Deli. Today: Back in 1976 (the oldest menu the deli could find), matzah ball soup ran you $1. 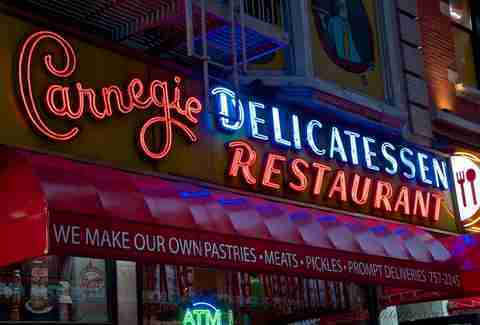 Sarri Harper, the Director of Marketing and Communications at Carnegie Deli, said matzah ball is still the most popular, but now costs $9.99 (add a dollar if you're hankering for noodles). If matzah isn’t your thing, they have daily soup specials. 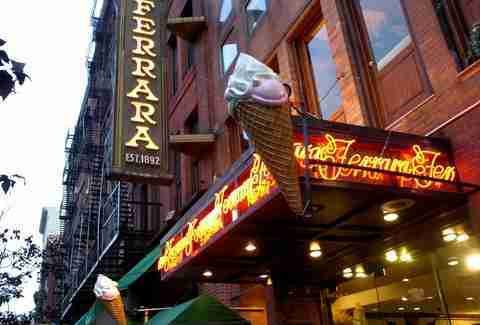 The Scene: Joan orders cookies from Ferrara’s for the meeting with St. Joseph’s Hospital. Ted and Peggy’s over-budget affair, err, ad is in question. Today: It can’t always be sidecars and porterhouses. Man’s gotta feed that sweet tooth. Next time you go to a Mad Men theme party, spring for the baked goods featured in the show. Whiskey is always better when the stomach has a solid base! Party goers will view you as an AMC aficionado, but really, cookies. Matthew Moll is a contributor to Thrillist and does not want to be told if this New York is actually a studio in the California desert in 2044. Follow him on Instagram.